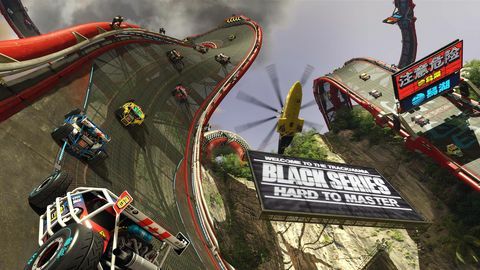 The basic premise of Trackmania hasn't changed since the series debuted more than a decade ago. Is it still worth a look? Alan straps in. Trackmania, on the surface, is a car racing game. It’s got cars in it and most of what you’ll be doing in them is racing. If, however, that’s the expectation you take to the experience, you’re going to have a weird time. 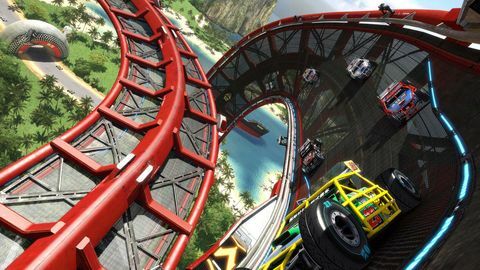 Trackmania, you see, is actually a car-based puzzle game that you must solve at breakneck speed – kinda like what you might expect if GripShift and Sonic had a baby. The premise of the series is simple; rip along impossible tracks like there’s a rocket strapped to your car and try your damndest to get to the finish without making even the slightest mistake. Turbo takes that familiar formula and increases the focus on arcade action, adds some 200 built-in levels, tweaks the art style, and bolsters the already impressive track editor with some extra features. Turbo is also marks only the third time the storied franchise has appeared on consoles; previously, only the DS and Wii were graced with Nadeo’s particular brand of car-based action. This time around, you can play on PS4, Xbox One, and PC. Control in Trackmania is a contentious beast. Fans of the series will be pleased to hear that there’s no marked difference between this and previous iterations, as far as vehicle handling goes. Newcomers, however, will need to prepare themselves for an adjustment period. Cars in Trackmania (and there are several different types, one for each of the environments) feel not entirely unlike you’re trying to direct a block of soap over a field of ice. Analogue control is a poor choice, with only steering wheels being a worse option. Instead, the d-pad needs to be your go-to, with hard, sharp, slamming left and right the order of the day. Once you get your head around it, you’ll be fine. Mostly. Another hallmark of the series that remains 100 percent intact in Turbo is the ability to reset the track you’re on at the press of a button. One touch of B and bam you’re at the start – no loading – just a 3-2-1 countdown away from trying again. This feature might seem superfluous but rest assured, by the time you’re a few dozen stages in, B will become your most-pressed button. It’s very easy to make a mistake in Trackmania and you’re only ever a single mistake away from failing the course. Sure, you can continue (there’s no such thing as death, as far as I can tell) but if you don’t get at least a bronze medal (something that will prove challenging to newcomers fairly quickly), progress becomes more challenging. It might sound like I’m bagging on the game, but I’m really not. Trackmania is what it is and it has legions of fans around the world for good reason. It’s a blast to play and at 60fps (with the odd drop / tear), and it’s one of the most intense gaming experiences you can have. The instant-respawn nature of the gameplay, combined with the generally short nature of the tracks, gives it that “just one more go” vibe that only the best games can claim to have. It’s fun, for the most part, with only the odd track here and there presenting a frustrating obstacle you’ll ultimately pass more through luck than skill. Cars in Trackmania feel not entirely unlike you’re trying to direct a block of soap over a field of ice. Multiplayer has always been one of Trackmania’s biggest strengths and Turbo delivers here in spades. 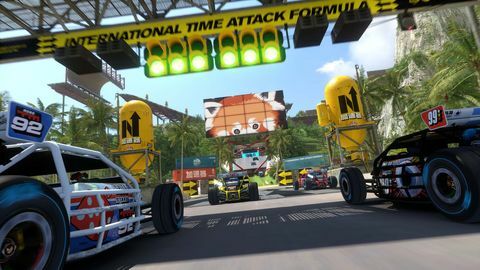 Most of Trackmania’s modes are played asynchronously in that you can reset and start over without impacting your chances, as each player is racing their own clock. You can still see the other players doing their thing, but their cars are translucent and you won’t collide with them. 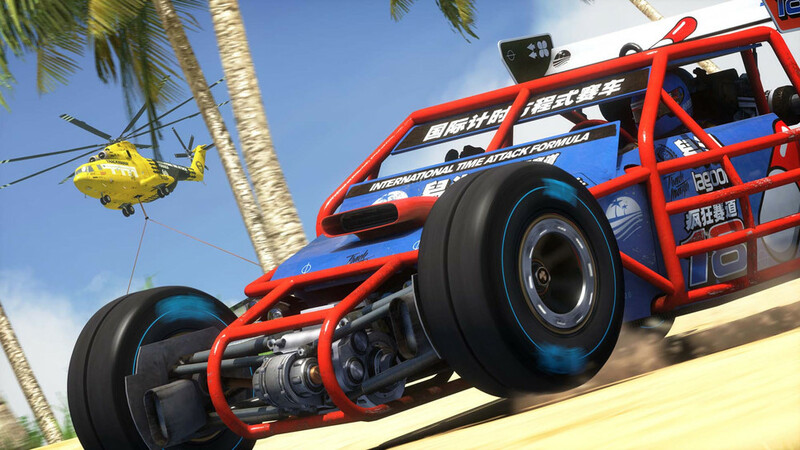 It’s a pretty great experience and one that meshes nicely with Trackmania’s focus on precision. For those with a content creation bent, Trackmania Turbo’s track editor is absolutely the star of the show. With it, you can create almost anything you can imagine, leveraging hundreds of different tiles in almost any way you could think of. There’s a beginner’s mode that is pretty easy to get into and more advanced modes that take the training wheels off once you get the hang of things. If you lack imagination, the editor will even create a random track for you which you can then hack to pieces to suit whatever whim springs to mind. You can then publish these tracks for your friends or even the public to play on, seeing if anyone can beat your time or simply using the opportunity to laugh maniacally as online victims are submitted to the torturous experience you designed. It’s a good looking game and it moves along at a fair clip. There is the odd slowdown here and there, but that’s rare. More common is the occasional frame tear but really, only the truly obsessive will spot it. The sound is a bit of a let down from previous incarnations, with some OK music that unfortunately resets every time you press B to reset your car. That makes for a pretty uninspiring musical experience, which is a big step backwards from the awful (but signature) techno / electro-pop that used to blast at you in previous games. The value proposition’s an interesting one; there are 200 (mostly sub 1-minute) tracks to play on, and you’ll likely need much, much more than 200 minutes to complete them all in. There’s also multiplayer, which is a lot of fun, and a track editor which should mean the multiplayer content stays fresh throughout Turbo’s lifetime. That said, at NZ$70 it’s still quite a lot more than it costs to buy other games in the franchise (typically NZ$30-45 on Steam). There’s even a free (as in beer, not as in F2P) version of the game called Trackmania Nations Forever. Still, if you like this kind of game (and it’s definitely a niche), you’d be hard pressed to argue that even at the higher price this is anything but value for money. Try it first if you can. For fans, Turbo’s a no-brainer and a welcome console edition of the franchise. Just don’t assume it’s for you because it’s got cars in it. Trackmania Turbo isn't substantially different from other games in the series: it's polished, fleet, and enjoyable. That makes it a great purchase for long-neglected console players, but it offers less to series veterans on PC. Ups Shiny new art style. Brilliant track editor. Downs The music ain't great, and resets when you do. Some screen tearing. It's pricey.